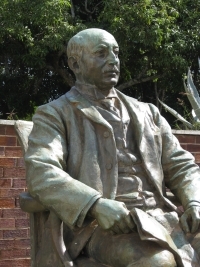 The Trust was established in 1906 by the Will of Alfred Beit, a financier, philanthropist and director of the British South Africa Company. He had many interests, including the development of the railway system in what was then Rhodesia. On his death in 1906, at the age of 53, he left a substantial legacy to a wide range of charitable causes. During his lifetime, Beit recognised that Northern and Southern Rhodesia (now Zambia and Zimbabwe) would be unable to attract sufficient capital for their own development. His Will therefore established The Beit Railway Fund, to promote the development of regional communications. This now forms the mandate for the modern operations of the Trust. The Trustees have always given preference to funding buildings and infrastructure. Grants are still occasionally given for very large new constructions, such as hospitals and schools. In general, however, most projects are chosen with the purpose of enhancing existing establishments or programmes, such as independent, rural and mission schools, hospitals and wildlife schemes. As a consequence, The Trust makes grants only to Zambia, Zimbabwe and Malawi: the “Beneficial Countries”. The Beit Trust Representative, 5 Ludlow Rd, Newlands, Harare, ZIMBABWE. While recognising the pressing need, the Trustees are aware of the extensive help given to AIDS alleviation and orphanages by other major donors, and therefore set limits to the Trust’s assistance with the pandemic. Academic and vocational bursaries are also provided at selected training organisations; and medical bursaries to selected British doctors and students whose visits are of immediate, skilled and practical benefit to hospitals in the three beneficial countries. The Trust provides a limited number of Postgraduate Scholarships for relevant courses at universities in the United Kingdom or South Africa. Candidates must be domiciled in Zambia, Zimbabwe or Malawi and aged under 30 (or 35 in the case of medical doctors). The Beit Trust does not sponsor undergraduates and seldom sponsors PhDs. The predominant scholarship offered is a one-year taught MA/MSc in a UK University (two years in South Africa). No candidate will be considered unless their future work is demonstrably beneficial to the people of their parent country. Please see our Grants, Scholarships and Bursaries pages for further details. The Trust does not offer gap year funding. Grants are still occasionally given for very large new constructions, such as hospitals and schools. In general, however, most projects are chosen with the purpose of enhancing existing establishments or programmes, such as independent, rural, or mission schools, hospitals, or wildlife schemes. The Trust provides a limited number of Postgraduate Scholarships for relevant courses at universities in the United Kingdom or South Africa. Candidates must be domiciled in Zambia, Zimbabwe or Malawi (the “Beneficial Countries”) and aged under 30 (or 35 in the case of medical doctors). Academic and vocational bursaries are also provided at selected secondary schools and training organisations, and medical bursaries are provided to selected British doctors and students whose visits will be of immediate, skilled and practical benefit to hospitals in the three beneficial countries.